Before going to sleep, frightened children ask their parents to check the bedroom for monsters. What child hasn’t imagined some terrible, red-eyed creature lingering in their closet or under their bed? It’s a universal concern. Or at least it used to be. Monsters, Inc. does something incredible and even transcendent. Through the Pixar team’s pristine animation, high-energy wit, and narrative economy, the film disarms all childhood fears about monsters lurking in the shadows of the bedroom at night. “Mommy, I’m scared of the monsters in my closet,” a child might say. “The only monsters in your closet are Mike and Sulley,” replies the parent. And thanks to Pixar, this makes the child sleep soundly with the knowledge that green one-eyed Mike Wazowski and blue linebacker-sized furball James P. Sullivan are there to protect little children. Such is the transportive magic of Pixar, their ability to turn the world upside-down and invent whole new perceptions. Released in 2001, the studio’s fourth major feature considers a world unto itself once again, a world that both children and adults take for granted. Prior to its release, the premier animation house explored a world of toys in Toy Story (1995) and its sequel Toy Story 2 (1999), and between them a world of insects in A Bug’s Life (1998). In all cases, the animation and storytelling is nothing short of exceptional. In Monsters, Inc., the film not only provides enchanting family entertainment, it provides parents with a way to dispel age-old fears. In Monsters, Inc., otherwise horrifying monsters punch a clock each day and report to work on the “Scare Floor” of the film’s titular workplace, wherein an elaborate setup opens literal doorways into the rooms of children. The monsters employed generate screams that, when converted to electricity, power Monstropolis—a cityscape overflowing with clever visual gags and nods more attuned to adults. An entire city populated by monsters of all shapes, colors, and sizes teems with the endless possibilities that Pixar is best known for exploring. Consider the restaurant called Harryhausen’s, named after the stop-motion animator of monsters from It Came from Beneath the Sea (1955) and Jason and the Argonauts (1963). Or the The Daily Glob newspaper headline that reads “Baby Born With 5 Heads—Parents Thrilled”. Citizens at Monstropolis buy their provisions at the grossers, and for a hot date their colognes range from Smelly Garbage to Wet Dog. Conversely and ironically, the very children that power the monster city are deemed toxic, and should any monster see one outside the Earth-realm, the Child Detection Agency (CDA) must be notified. A reoccurring joke involves fuzzy scarer George Sanderson, who’s continually decontaminated (via shave and cone-of-shame) by the yapping CDA. Monstropolis is a world so imaginative and fully detailed that, despite the complexity and originality of the concept, it also happens to be simple enough for a child to grasp. The top scarer at the Monsters, Inc. facility, Sulley (voice of John Goodman) lives with his assistant Mike (voice of Billy Crystal), and the two compete against the chameleon-like Randall Boggs (voice of Steve Buscemi), whose lizardy movements denote his villainy. Times are desperate, as the company’s numbers are at their lowest, and Monstropolis is facing a “scare shortage”. Children just aren’t scared of monsters anymore. One night while suspiciously working after hours, Randall leaves one of the doorways to a child’s bedroom open and a child, an adorable 3-year-old girl named Boo (baby-talk by Mary Gibbs), makes her way into Monstropolis. Sulley finds her and, in a panic, tries to hide her from Randall, having discovered his nefarious plot. In time, Sulley and Mike find that human children are neither contaminated nor dangerous, and they set out to expose their company’s propagandistic method, propelled by crablike monster Henry J. Waternoose III (voice of James Coburn). By the end, they realize a child’s laughter is even more energizing than a scream, and they all resolve to become comics instead of scarers. Produced by Pixar and released by Walt Disney Pictures, the film’s story was developed by Pete Docter, John Lasseter, Joe Ranft, and Andrew Stanton during the making of Toy Story. As the filmmakers spent the day virtually surrounded by animated toys coming to life in a child’s room, they began to consider other elements of childhood, namely the things that go bump in the night. Docter developed the story as other Pixar talents focused their energies on A Bug’s Life and Toy Story 2, although Docter’s screen story would change drastically from 1996 to 2000. His ideas ranged from an adult dealing with his childhood fear of monsters to a preteen being swept up in the Monstropolis intrigue. Finally, Docter and his fellow writers (Jill Culton, Jeff Pidgeon, and Ralph Eggleston) settled on a plotline and left the credited Andrew Stanton and Daniel Gerson to write out the screenplay. Released the same year as Shrek, and unfairly overshadowed because of that film’s forgettable success, the film helped establish the now-standard method of animated screen stories more geared toward adults than catering to children. 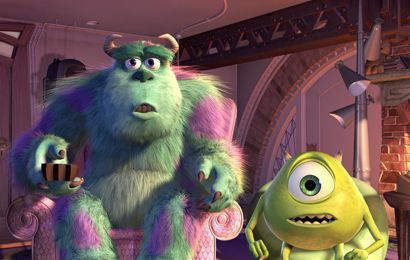 At a concise 92-minute runtime, Monsters, Inc. runs the gamut of emotions and adventure. 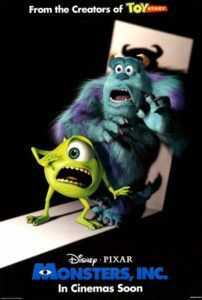 There are laughs abound as Sulley and Mike try to hide young Boo in an absurd monster costume, and through these scenes is a feeling of suspense. At any moment they might be found out. There’s a thrilling sequence where our heroes attempt to return Boo to her bedroom, and we’re carried into an assembly line of children’s closet doors that looks something like the biggest dry-cleaner conveyor ever. 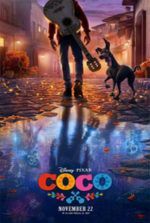 All of the thrills and ceaseless humor (thanks in large part to Crystal’s voicing of Mike) would mean nothing if the film wasn’t so emotionally compelling. Pairing the tiny child with the towering monster—whom Boo calls “Kitty!”—is genius visual juxtaposition. Of course, the animators have made Boo ridiculously cute and for the most part naïve to what’s going on around her, her emotional responses raw and the definition of innocence. For barely a moment we experience a sense of peril, which is over when Sulley, the lofty hero (sporting over 2 million strands of fascinating, individually animated hairs), charges to Boo’s rescue. Even on subsequent viewings, the touching relationship that develops between our central monsters and Boo tugs the heartstrings. In subsequent years, other animation studios tried and failed—often miserably—to bring humanity to various monster worlds: Monster House, Monsters vs. Aliens, Igor, Hotel Transylvania, and others have all lacked the pitch-perfect blend of imagination, energy, and heart applied in Monsters, Inc. With this film, Pixar demonstrated that they were more than just a one-trick-pony reliant on their Toy Story franchise. 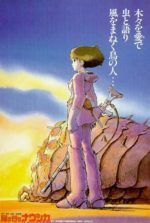 They began to set the standard for other computer-animated films and in that explore the far-reaches of their medium with adventure, humor, and intelligence, all while speaking to a universal audience from young to old. With their efforts to follow, Pixar would explore other niche worlds, such as the bottom of the ocean, the reality of comic book heroes, or the solitude of the last garbage robot left on Earth. And since each film investigates such a world with profound detail and narrative ingenuity, and best of all uses glorious and unmatched animation, Pixar has raised animation to heights that in 2001 seemed unreachable. 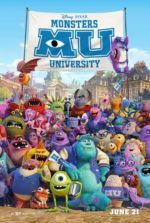 Monsters, Inc. is another in a long line of Pixar films that show how an animated motion picture can be great entertainment, but also so much more.